Another successful litter pick up today around Widewater! 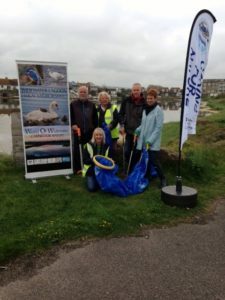 Ten people came to help and we collected about 10 bags of litter. No extraordinary items were found today, just the usual items – crisp packets, sweet wrappers, bottles, packaging, carrier bags, balls, cigarette ends ( for the well practised pickers! ) One bottle had been smashed on the bank of the lagoon at the eastern end and so we collected all the dangerous shards of glass, a real hazard for the wildlife. The weather was cloudy but no rain so we were lucky. Our new banner and flag were displayed at the event though Marion and I had to enlist the help of two kind members to put them up. To be fair we didn’t have the instructions! A huge thanks to Ian Brereton for organising the event and all the equipment and his kind wife for being his chauffeur today! The lagoon is looking clean and tidy once again ready for the new arrivals – hopefully. We had a sneaky close up view of the Swan nest after the event thanks to David Wilson who lives right by the nest and who keeps a close watch on the Swans. The male was on the nest keeping the eggs warm whilst the female was having a well deserved bath in the lagoon! No sign of the cygnets yet but I think they will be hatching any day now. Last year they were on the water on the 1st May. Keep a look out for them and please leave fresh water out for them if you live on the lagoon. Many thanks.